ContiTech conveyor belts meet conveying needs around the world. The company is a renowned development partner, manufacturer and system supplier of steel cord and textile conveyor belts, service materials and special products. ContiTech conveyor belts are divided into four market segments: Mining Europe, Mining World, Industry and Engineered Products. Around 4,000 employees develop and produce at 17 locations in Australia, Brazil, Chile, China, Germany, England, Finland, Greece, India, Mexico, Hungary, Serbia, Slovakia and the United States. Incorporated in the ContiTech division and thus a part of Continental AG, the Conveyor Belt Group benefits from the know-how from an extremely wide range of industries and their potential synergies. Thanks to its international structure and consistent growth in the markets worldwide, the conveyor belt specialist has positioned itself on a firm foundation. As an internationally recognized partner, the company offers reliable and cost-efficient conveyor belt technology to customers all around the world, also including belting solutions for extreme climatic circumstances. For the mining industry, ContiTech features a comprehensive product range covering all tasks above and below ground. Intensive fundamental research and years of experience with a wide variety of conveyor belts provide the basis for successfully implementing conveyor belt systems above and below ground. In its R&D centres, the company develops conveyor belt technologies that meet the demands of today and tomorrow. For its industry customers, the company supplies original equipment manufacturers and operators of conveyor belt systems worldwide with everything from one source, and the same original equipment quality is provided to trade partners as well. ContiTech also offers special-purpose conveyor belts and conveyor technology solutions for machine and plant engineering. These products take on a variety of tasks in various dimensions, often even simultaneously, from conveying through driving up to filtering and guarding. ContiTech steel-cable and fabric-reinforced conveyor belts allow for maximum conveying capacities, even under extreme climatic and topographic conditions. They are used in mining above and below ground, in loading and unloading plants, and in other industries. Their tough construction guarantees high breaking load and good impact resistance. 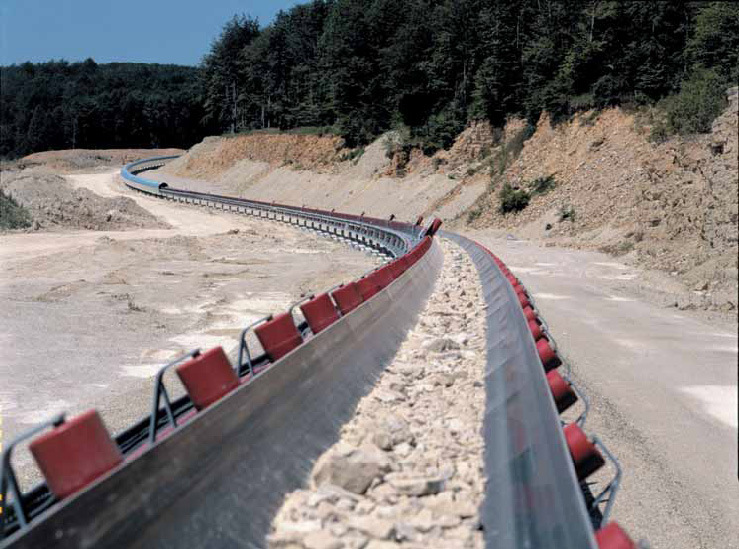 Thanks to ContiTech’s great material expertise, the conveyor belts demonstrate minimal elongation, even over long distances. Thermally stable and resistant to wear, rot, corrosion and chemicals, steel-cable conveyor belts achieve a long service life while requiring little maintenance. Depending on the application, fabric-reinforced conveyor belts transport goods containing oil and grease, hot goods (up to 200°C) or sharp-edged goods, even up inclines of up to 30°. Depending on the application, textile conveyor belts feature various cover stock properties and a single- or multi-ply textile tensile member. The durable products master diverse conveying tasks in open-pit and underground mining. One highlight of the product portfolio are MegaPipes, which are establishing new standards in closed-trough belt to 3,200mm enables a significant increase in the capacity of conveyor systems by more than 100% compared with standard closed-trough belts. While crushed mineral ores, rock or coal have to be technology. MegaPipes can offer diameters as wide as 900mm. The larger belt width of up laboriously reduced in size for transportation with standard closed-trough belts, MegaPipes enable transportation directly after the primary crusher. ContiTech has developed an online customer advisor in the form of three web tools. The new service offerings include six-step installation instructions for steel cord conveyor belts. Another application briefs the user on nine causes of belt misalignment and gives instruction for optimizing alignment. Both applications include animated video sequences and are available in nine languages. The ContiTech CareWell web tool provides an overview of the ContiTech conveyor belt service materials and visualizes their impact on a virtual conveyor. It reacts to the activation and deactivation of the components and visualizes the effects that the various service materials have on the system and the conveyor belt. Product information is available using a zoom function. Users can access the three web tools on the company’s website. In addition, the Mining Calculator computer programme available from Mining Technology Consulting in Clausthal- Zellerfeld, Germany, enables mining companies to calculate and compare future load and transport combinations for specific mining projects. They can then identify the best combination of truck or conveyor belt haulage from both an economic and environmental standpoint. Service is a top priority for ContiTech: at all production and sales sites around the world, the company is working every day to improve customer-oriented processes. Therefore, the company supports its customers by providing a comprehensive service. The company accompanies every order from initial planning and consultation through start-up to after-sales service of the products in use. The service and support philosophy of the company is carried throughout different stages. During the planning phase of each order, the company acts as a problem solver and provides extensive expertise in order to offer the right solution for individual conveying tasks.